My Comments: It’s a given there will be a ‘next recession’. People much smarter than me say it’s not many months away. It’s a normal event and we’ll most likely survive. What we may not survive, however, apart from a random collision with an asteroid, are the effects of income inequality across the planet and the massive debt overhang facing us in this country. Combine those two forces and you know there’s going to be chaos down the road. In the coming years, we will have to deal with the largest twin bubbles in history. It’s global debt (especially government debt) and the even larger bubble of government promises. 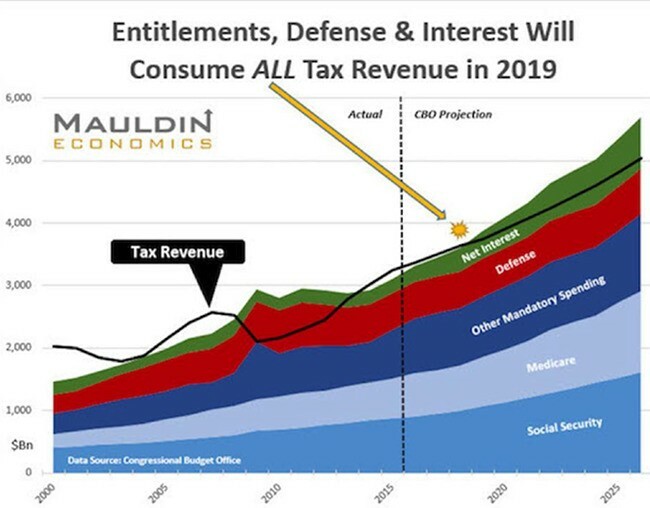 Together, these twin bubbles make up what investor John Mauldin calls “The Great Reset.” Nobody can tell how this crisis will play out, but one thing is for sure, it will affect everyone in a big way. The mere existence of these bubbles has profound economic implications, as research shows high debt levels weigh heavily on economic growth. The total debt-to-GDP ratio is at 248% today. The non-partisan Congressional Budget Office (CBO) projects it will rise to 280% by 2027. And that’s assuming nominal GDP grows at 4% per annum. Despite the post-election optimism, nominal GDP growth in 2016 was just 2.95%—making it the fifth-worst year on record since 1948. There are no signs it will pick up soon either. That means the reality may be even gloomier than what the CBO projects. If a higher debt burden means lower growth, the recovery from the next recession, whenever it arrives, will be even slower than the last. Those sky-high debt-to-GDP ratios don’t factor in the unfunded liabilities—pensions, Medicare, and Social Security, which the US Government has promised to millions of Americans. Those total about $100 trillion today. Last year, the first baby boomers turned 70. The average boomer has just $136,000 in retirement savings. If that individual lives for 15 years after retirement, his annual income comes to just $9,000. Because boomers are living longer and need income, they’re staying in the job market longer. The fastest employment growth now is among people 65 and older. However, with 1.5 million boomers turning 70 every year for the next decade, a huge strain will be put on government finances in the form of pensions and Social Security. But the pension crisis isn’t just in the US. A Citibank report shows that the OECD countries face $78 trillion in unfunded pension liabilities. That is at least 50% more than their total GDP. Pension obligations are growing faster than GDP in most, if not all, of those countries. Those obligations sit on top of a 325% global debt-to-GDP ratio. Politicians and central bankers could try to “fix” these problems in several ways. They could default on the debt and pension obligations, or they could print money to fund them. There is no way of knowing ahead of time how these bubbles play out. What we do know is the chosen approach will bring a different type of volatility and effect on the markets. For investors, this will be a period of enormous volatility. That’s why it’s essential to arm yourself with the knowledge of how to deal with this volatility ahead of time.